Two little dancing dolls, made using my 'Irish Dancer' pattern. 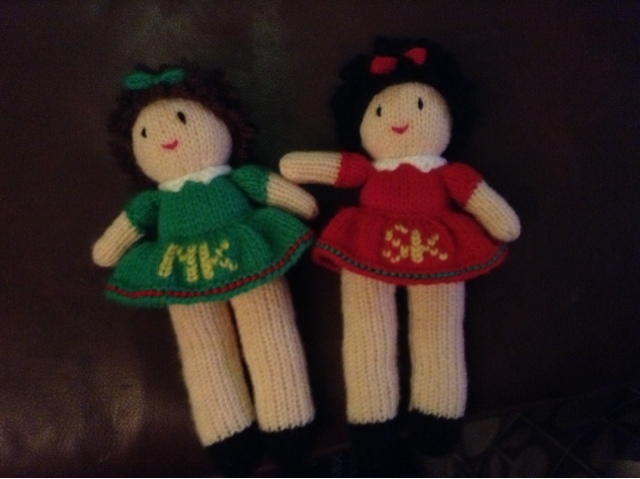 These two are a custom order for two little girls in America, and they'll get them on St. Patrick's Day - very apt! I've wanted to get Emily a house for her Barbies for a while now, as I think she would play with them more if she had a house. However, they are quite expensive to buy so I started researching making one online, and found this.. The most amazing Barbie house ever made, from the IkatBag blog. How cool is this mam. Click on the pic for a link to the actual blog post. Now, just need to find some cardboard!! Loved this pattern, and love the whole book. I'd love to make quite a few hats from it. This hat is destined for a present for someone else. I quite like it though so might have to make one for myself!